Hummingbirds may reduce SWD : Spotted Wing Drosophila Latest information from the NYS IPM Program. 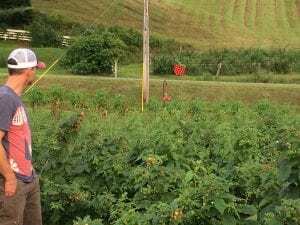 Research in raspberries at Cornell AgriTech over the last four years has shown promise as an alternative tactic to reduce the impact of SWD on berries. As described in a previous blog posted in 2014, Hummingbirds, these birds may indeed enjoy eating SWD. A trend of fewer SWD caught in traps in positions 1-4, where hummingbird feeders are located, compared to more being caught in positions 5-9, where there are no hummingbird feeders, in a transect along a raspberry planting. 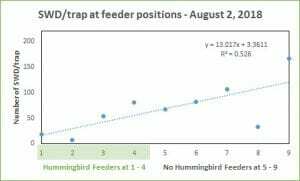 Preliminary data analysis for 2018 shows that when SWD numbers are very low or very high, there is little to no difference in the number of SWD caught in Scentry traps placed in the area of the field with hummingbird feeders compared to those in the area of the field without feeders. However, when numbers are moderate, there was a difference. Along a transect down the length of the field, the trend was for there to be fewer SWD in the hummingbird feeder area compared to the no-feeder area, as shown in the chart. The diet of an average hummingbird consists mostly of flower nectar and insects. Flower nectar provides sugar to support their high metabolic rate… even higher during flight due to their rapid wing flapping rates. The insects hummingbirds eat provide them with protein, amino acids, and necessary vitamins and minerals. The insects must be small enough to swallow whole during flight — watch out, SWD! A grower at the SWD workshop watches as a hummingbird visits a feeder in the raspberry planting. Two grower demonstrations were undertaken this year, as well. One in blueberry and one in raspberry. 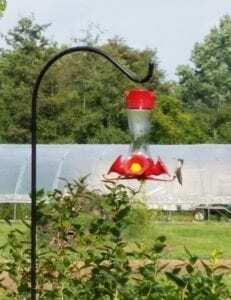 Both growers undertook cleaning the feeders and changing the sugar solution twice per week to keep the hummingbirds well fed and active within their plantings. At the workshop held in Salem, NY last month, several of the tiny birds were seen dashing about. Placing and maintaining 25 hummingbird feeders per acre, may be a bit too arduous for some growers. This is the number of feeders we’ve been using in our research and grower demonstration plots and the number used by the blackberry grower in Mississippi. Other ways to attract hummingbirds to your berry planting that don’t rely on the use of feeders, would involve allocating space for flowering plants that they prefer. Interplanting with rows of Monarda (bee balm), for instance, would be one approach. Of course, SWD is around a lot longer than hummingbirds, which have, at this point in time, likely flown off to the South on their journey to the Yucatan peninsula in Central America. Flying across the Gulf of Mexico or along Mexico’s coast, they make their way to their overwintering grounds. And, as SWD populations explode in late summer, it is difficult to control SWD, let alone rely on a flying predator. If you think hummingbirds don’t eat small insects, then guess again! 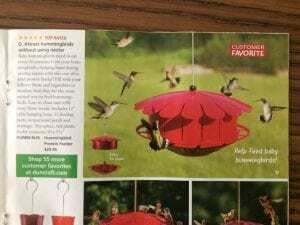 I’ve seen these contraptions showing up in stores this year — to feed hummingbirds. They are rearing capsules for fruit flies (vinegar flies, as entomologists call them). Perhaps someone should tell them we don’t need more SWD? …just more hummingbirds!